Marine engineer and ship-builder. Born in Glasgow, with Charles Randolph, Elder founded the noted ship-yard of Randolph, Elder and Co in Govan. This became one of the best known yards on the river and helped establish 'Clyde-built' as a brand of quality and reliability. Elder developed the use of the compound steam engine for ships. These were much more efficient than previous engines, significantly reduced fuel consumption and thus allowing longer voyages. He was regarded as a progressive employer, especially in terms of his attitude towards industrial relations. 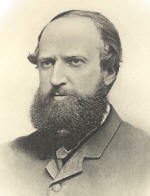 He died in London, but is remembered through several benefactions by his widow, including a park and statue in Govan and the Chair of Naval architecture at the University of Glasgow. After his death his company was run by his widow Isabella (1828 - 1905) and renamed John Elder & Co in his memory.